After selling 1.287 million albums in it's first week, Taylor Swift saw her fifth album hit No. 1 on the Billboard 200, again. 1989 moved 402,000 in its second week, which is actually more copies than recent albums from Katy Perry and Lady Gaga moved in their first weeks. Billboard has posted a breakdown showing how Swift's new album is selling across different regions in the U.S. -- and to see how 1989 is faring in different major cities. 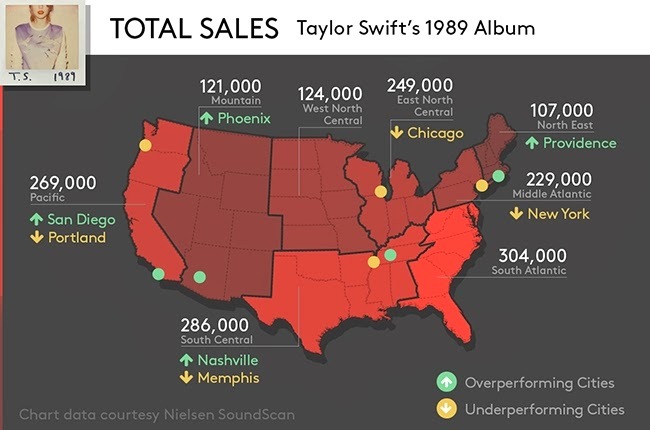 Since Taylor loves red (it's her go-to lipstick color, she named an album after it), Bilboard took Nielsen SoundScan's regional breakdown of the U.S. and rendered the map in varying shades of red. The map is bright red in areas where 1989 sold the most copies, but a duller shade of red where it sold fewer copies. These are the numbers 1989 has moved since its release date up until the week ending Nov. 9, data courtesy Nielsen SoundScan. As you can see in the map above, Swift's 1989 is moving the most copies (so far) in the South Atlantic and South Central regions. It's moving the fewest copies in the North East and Mountain regions, but that's hardly atypical for album sales in the latter two regions (nearly every other album in the top 10 this week is selling the fewest copies in those regions). What is surprising, though, is that Swift's 1989 is actually underperforming in New York City -- even though the record opens with a track called "Welcome to New York" and Swift just became the city's official welcome ambassador. SoundScan has a metric to determine an album's relative performance in a city, called the DMA Index (Designated Market Area Index). A DMA is a city like New York or Los Angeles, and the DMA Index measures the performance of an album in a market in comparison to overall sales of current albums in that market. Think of it this way: If New York represented 10 percent of all current albums sold in a week, but an album sold 8 percent of its total in New York, then it would be underperforming as compared to rest of the current market. And 1989 is definitely underperforming in New York City. Unsurprisingly, it's also underperforming in Portland, Ore., the nation's indie music capital. But you knew that would happen anyway. On the other hand, 1989 is over-performing in major cities like Phoenix, San Diego and especially in Providence, Rhode Island -- meaning it's selling more copies as compared to general current album sales in those cities. But that's not to imply a given state's purchasing trends are uniform. In Nashville, the town Taylor used to call home, 1989 is seriously over-performing. But in Memphis, another Tennessee music town, 1989 isn't as hot compared to the general market. Regardless, Swift's still got the No. 1 album in the country for two weeks -- and the best album sales week since Eminem's The Eminem Show.